Reverie produce rear diffusers designed for fitment to a specific vehicle. We make rear diffusers for vehicles made by Caterham, TVR and Lotus in either single or multiple element versions. Like all of our products our rear diffusers are autoclaved to achieve the best finish possible. Rear diffusers can be lacquered to increase protection from UV and increase the parts life span. 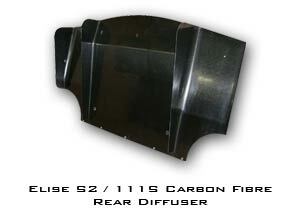 Examples of fitted rear diffusers can be seen in our product gallery. If you have any questions regarding our rear diffusers or any of our products please feel free to contact us.